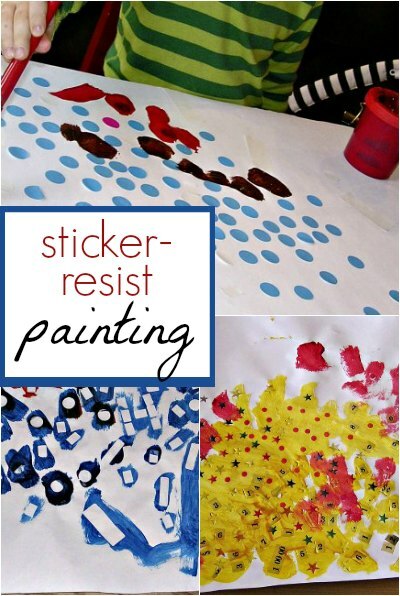 Resist painting using stickers is an easy way to make a simple art project a little more enticing, especially when your kid, like mine, has been protesting, “I don’t want to take art class” every time I suggest we sign up for one. A few well-placed office supply stickers helped us explore a different kind of resistance. This is a also good activity for using up a lot of time when you are stuck indoors; there can be quite a bit of labor involved in applying and removing all the stickers!!! You can see Kiddo took my instructions to paint over the stickers very literally. He was avoiding getting paint anywhere else! I recommend using office supply stickers for this since they are 1) cheap; and 2) low tack, so easy to remove (depending on the thickness of the paint applied). We used circles, but it would be fun to experiment with different shapes, too. I don’t need to give much instruction here: simply spread out a piece of paper and offer up some stickers. Sticking on the stickers can be just as much fun for some kids as the painting part! Maybe even more fun, sometimes? Removing the stickers also worked his fine motor skills! I love sneaking that sort of thing into our play time. Here’s what it looked like after we removed the stickers: This one he did not want to take off the stickers. I was kind of relieved since he would have wanted me to do most of the work. Look at how tiny those stars are! Need another indoor art project? Check out our giant list of indoor activities for kids. Neat idea! My girls love to paint…put stickers into the mix and they will be overjoyed. Thanks for sharing! it is interesting to me …how the child’s personality plays into the art. Mr. Intensity gets bored with details; I wonder how he would do with this project. I’m marking it to try in the future. i think he would pull off 2 stickers then declare that I must do the rest. We’ll see. Thanks for sharing the great idea. It’s good to hear of other 4 yr olds that aren’t into representational art. On the one hand I’m good with it. I want him to do stuff on his own time line and enjoy the process. On the other, I sometimes get worried. Such is the lot of a mother. This is a great idea, thank you! I really love the brown and red one with the peeled off stickers (polkadots). So frameable! oooh, i want to try this with my daughter, who is currently sticker-obsessed. when i do, i'll blog about it and link to this. i'll letcha know how it turned out!